With voices by big names such as Bruce Campbell ( Mayor Shelbourne) Mr T (Earl) and Lauren Graham (Fran) this move was bound to be a success and it certainly is. Based on the best selling book by Judi Barrett the story of inventor Flint Lockwood takes place in Swallow Falls a once busy but now dying tourist town. Known for its sardine trade it attracted loads of visitors but that is the past and now the only ones eating sardines are the locals. . Flint takes this opportunity to add to his inventions. Creating a machine that delivers breakfast, lunch and dinner from the clouds gives him the publicity he always wanted and for once it is good publicity. It also gives his weathergirl girlfriend the chance to make her break in the world of news. An excellent movie for all ages Cloudy with a chance of meatballs is colorful, energetic and funny. However the 3d was the worst I have seen. 3d movies like Beowulf, Nightmare before Christmas, Coraline and even horrors like My Bloody Valentine leave you with the wow factor. 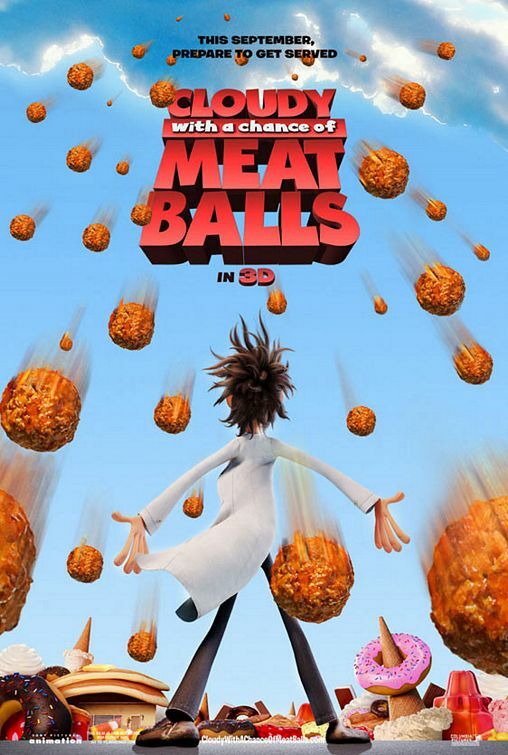 However Cloudy with a Chance of Meatballs suffers from extremely poor 3d. There are moments throughout where you have to say to yourself and remind yourself that the movie is in fact in 3d. There is nothing to surprise you to wow you. What could be better than some ice-cream coming towards the audience or some donuts or even hot dogs. But no this doesn’t happen. Overall verdict: A must see but save your save the extra and don’t bother with the 3d.